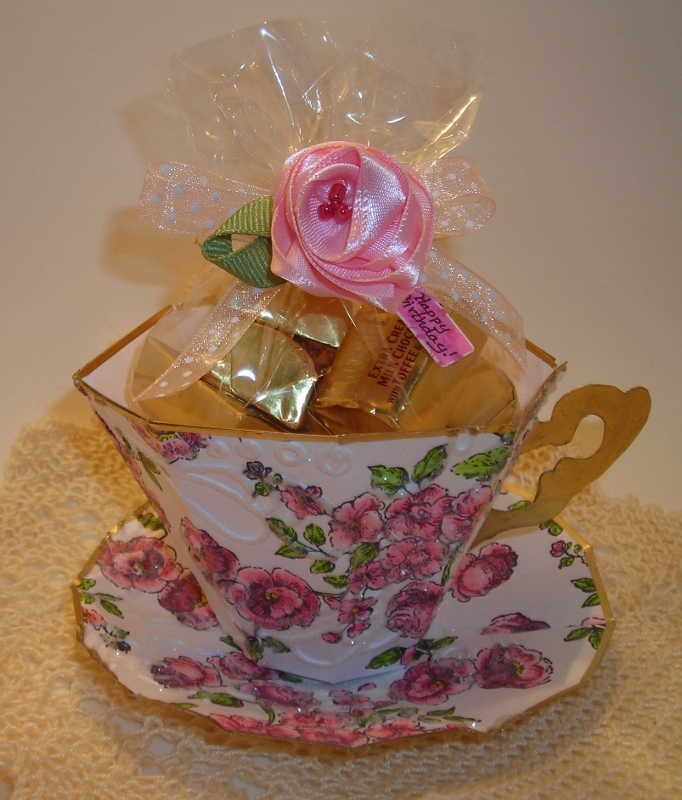 TLady Designs: "Oh So Pretty in Pink"
"Oh So Pretty in Pink"
Today, I'm going to share with you another one of my Beveled Tea Cups! I had another post planned BUT, DISCOVERED a blog I like to follow, The Shabby Tea Room http://theshabbytearoom.blogspot.com/ has a challenge going that would fit what I've done! 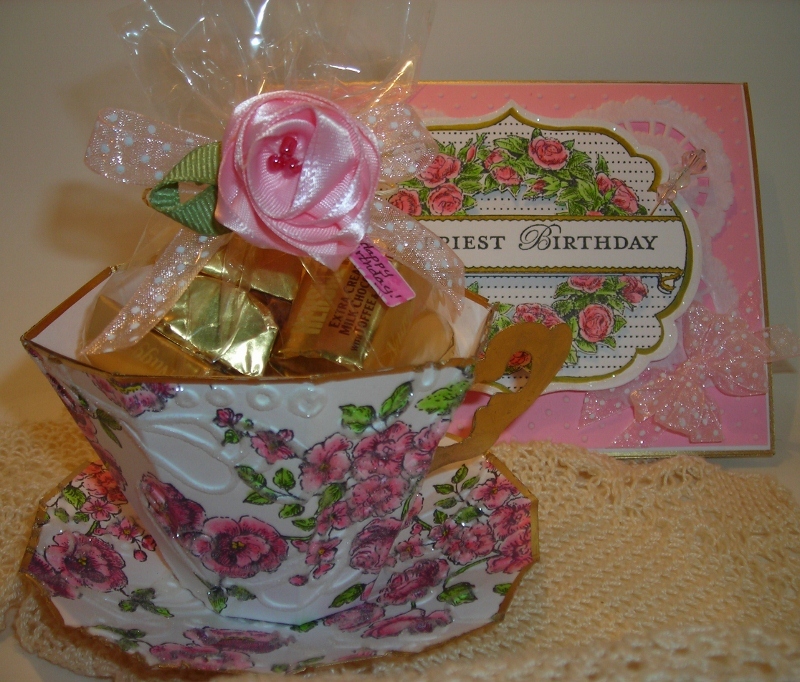 I had this pretty Pink Rose English China Cup all ready for a friends birthday! ( She'll be getting it early! I didn't want to post before she even got her little package; it would spoil the surprise! ) 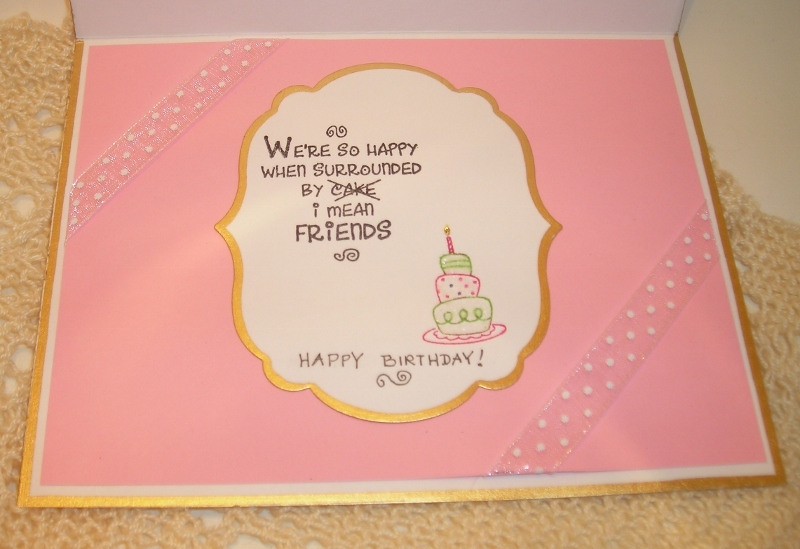 I had yet to make the card. So, I set about making the card & giving my Tea Cup a little addition! Here is the picture for the inspiration! 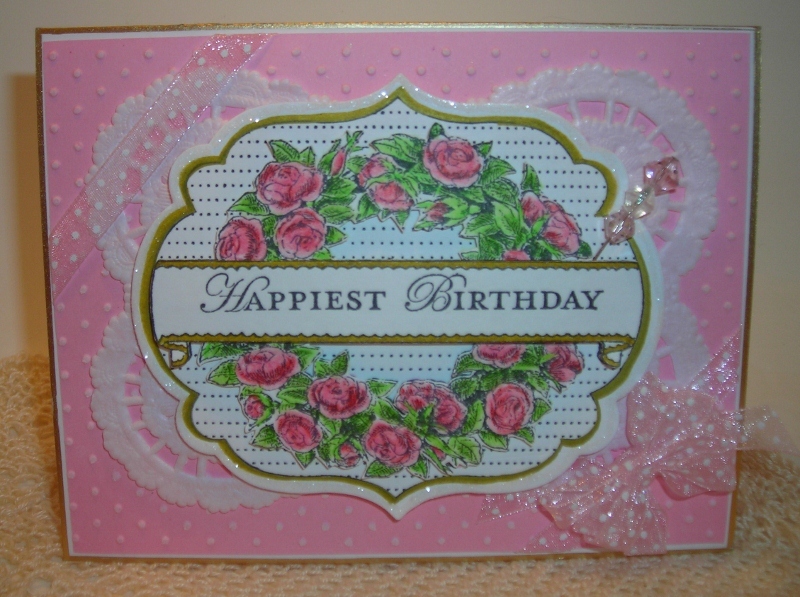 The requirements are to create a card or project inspired by the colors & include a flower. Here are some additional photos to get an even better look! My Pink Rose English Tea Cup & Saucer from my own template. I used SU- Elements of Style, Prisma Watercolor Pencils with a blender pen. I also embossed the Tea Cup & the Saucer with the SU- Elegant Lines Folder. I used MS Crystal Fine glitter on the embossed lines, a Gold Krylon Pen, SU- Tiny Tags that I wrote "Happy Birthday" on & a SU- Cellophane bag. I made the Pink Rose from Satin Ribbon for the flower I was to add to my project! WHAT A LOVELY ADDITION! ( I'll have to remember to do this in the future!) Here is a better look at my card! What do you think? I LOVE this SU set, Apothecary Art! I've had my eye on this set since it came out! I think it matches the set by SU- Elements of Style very well! I used Prisma Water Color Pencils & a blender pen on this too, a Cuttle bug folder- Swiss Dots, Inking the dots with White ink, 2- lace heart doily's, an EK Success Gold Calligraphy Pen- for those detailed areas, Gold Krylon Pen, Dimensionals- used on the wreath, the banner & the Labels Collection Framelits Die, which I edged with MS- Crystal Fine Glitter, the Becca Bow Maker, Jewelry Findings & Glass Crystal Beads. Here is the SURPRISE inside! "We're so happy when surrounded by cake I mean FRIENDS." I've been saving this sentiment for sometime, for just the right card! I like to add a sentiment inside that you wouldn't expect! The sentiment is by Eat Cake Graphics. The little cake is by SU- Birthday Bliss, I used the MS Crystal Fine Glitter on the cake, adding gold Stickles to the flame & I wrote in the Happy Birthday! BE SURE to come back next week when I share an "Organization Recipe- for Stampers!" Take some time to tell someone how much you love them this week! Hi my new friend, TLady!!!!!! I am very happy to meet you and thanks for your sweet comment! 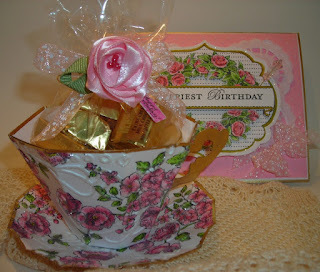 I saw your gorgeous teacup and card on Dawn Griffith's blog. Talk about gorgeous! WOW it really knocked my socks off. So beautiful and the detailing that ou do is just amazing. Thank you for the inspiration! Now I'm off to visit the rest of your blog! Love,love,love your teacups!! Is there anyway to get the template so that I can make table favors for our church tea? I really enjoyed looking through your blog. Can't wait to see what other creative ideas you'll add! Hopping over from Dawn Griffith's blog. Your tea cups are beautiful! Thanks for the smile and lovely inspiration on this Monday morning! In one of your earlier posts, you were thinking of possibly sharing your template. Is that still an option or will you be selling it? 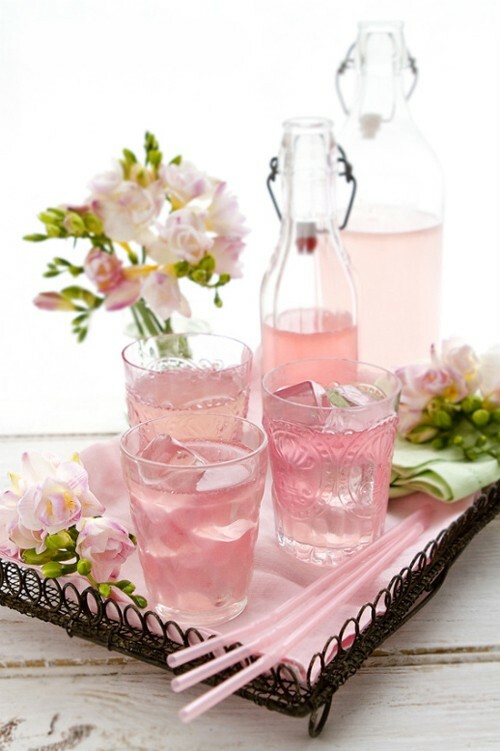 I just LOVE these and would love to be able to make them for gifts for my mother and best friend. The other comment I was wondering if there is any way to choose a darker font to make it easier to read your bog. The font is small so it makes it harder to read in the lighter color. I just love your teacups. Where did you get the template? The detail is amazing! Hi there. Was thrilled to find out you have your own blog, but I can barely make it out. The font is so small on my computer (17" screen) and fancy that I have to zoom into it in order to read anything. Perhaps you could change the font so everyone can read it. Wow what a wonderful gift for Dawn, I came from her blog. Are you sharing the template? I have a friend who is getting married and would love to make one for her. I dont have a blog...so I am leaving my email address. I echo the above comments! I also follow Dawn's blog and your teacups are beautiful! I am also interested in knowing if you make your template available. I also appreciate sooo much that you are a sister in the Lord! : ) God bless! Your teacups are gorgeous! Hoping you will do a video and share your template. Beautiful work. 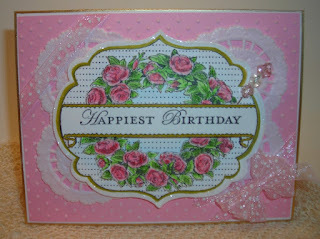 Love your tea cup card and would like to get the template - are you able to share it? I LOVE your teacups. Do you have a tutorial anywhere on how you make them? These teacups are to die for! I'm not a big tea drinker, but I love these teacups and would love to make them for gifts for my tea drinking friends. Will you please do a tutorial. I wouldn't even mind paying a fair price for it. I'm a fan of Dawn's blog and saw her teacup & had to come over here. Love your blog! I did'my realize your gracious for Dawn was paper! It is so beautiful! I'll be following your blog too. Thank you for your precious testimony for the Lord. Oh my gosh the tea cup and saucer are to die for. I have come over from Dawn's wonderful and inspiring site and am now a follower of yours. I love your style. The cakes are gorgeous and wish i could do that! I would give anything for the templet for the tea cup and saucer i would pay for it also. 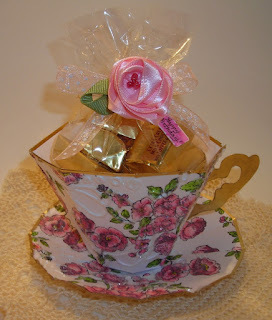 I do a Mother's Day tea for my 70 church ladies and always need things I can make for that. They would be so thrilled!! GOD has blessed you with a wonderful talent!! Thanks for sharing.. Simply Stunning! I would be willing to pay for a tutorial as well. I love making the 3D items and I have lots of 'tea' friends. TFS your beautiful blog. Just beautiful - I too would love the template for the cup and saucer. Is there a website to purchase it from? MORE ELEGANT PAPER TEA CUPS!